Young entertainer finds astonishing phantasm of old Hollywood- experts stunned! LOS ANGELES, CA. –October 21, 2002 – No "Hocus Pocus" here… The popular Techno-Magician, Jeremy Vargus, is made a true believer in the supernatural when he finds a strange image appear in a photo taken of him with a group of friends and fellow cast members, while attending an industry event at the famous Hollywood Palace Theater. Vargus recently discovered the apparition after having the Kodak disposable camera developed at a near by Right-Aid. At first, he thought the lab had not developed the photo properly, but he had a suspicion that it might be something more. Vargus had sent the photo to a few well known "ghost experts" and was shocked to hear what he had indeed captured…was a ghost! "Being a magician and working with the art of illusion my whole life has obviously made me a skeptic on anything called ‘super natural.’" Says Vargus. "Magicians for centuries have claimed to have powers to conjure up spirits from beyond the grave as a part of their onstage spectaculars. Magic is very much a science therefore I look at things from a very scientific approach. After having the photo analyzed and verified, I must say that I’m a believer. There are some things that cannot be explained and that’s a very difficult thing for a magician to accept." Nationally renowned paranormal expert Donna Quinn analyzed the photograph. 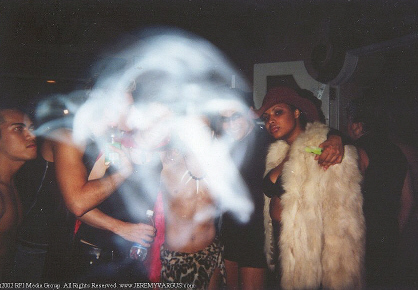 "I find Jeremy’s photo very interesting and it smacks of true ghostly energy." Say’s Quinn, whose amazing findings have been featured on numerous television and radio shows including, "Sightings," "The Maury Povich Show," and "The Independent Film Channel." Fellow Magician, Tom Ogden, author of "The Complete Idiots Guide to Ghost and Hauntings" also spoke of the "fascinating" phantasm and some of the ghostly history of the Hollywood Palace Theater. "The Palace opened in 1927 as the Hollywood Playhouse to house legitimate theater. Since that time it has housed radio and television shows and most recently a night club venue. With such a history, it would actually be unusual- to Hollywood standards- if it weren’t haunted. But, don’t worry: it is!" Spectral phenomena at The Palace has included a piano locked inside a room playing jazz music on it’s own, cold drafts and phantom taps on the shoulder. One security guard reported seeing a tuxedoed man with no face. He was standing but had no feet. The phantom was also sensed and chased by guard dogs. This and many more unexplainable apparitions have taken place at the historic Hollywood landmark explained Ogden. Vargus recently returned to his Hollywood home after an extensive run of shows on the road and is currently working on a "Techno-Magic Spectacular" to be performed at the Hollywood Palace Theater in late November. "Anything that haunts an old theater must be a fan of the arts. I certainly hope whoever or whatever dwells within the venue will welcome my presence." Says Vargus. "After all, bad reviews can hurt one’s career, but who knows what a spiteful spirit might do."